Capt. Amrinder Singh of Congress is the current agriculture minister of Punjab. Actually he is the Chief Minister of Punjab and also has agriculture department in his portfolio. So one may say that he is the agriculture minister of Punjab. During the previous SAD + BJP govt in the state, Tota Singh of Shiromani Akali Dal was the agriculture minister. In last assembly elections held in 2017, he became MLA from Patiala Urban constituency in Patiala district. He won by a margin of 52407 votes and Dr. Balbir Singh of AAP was the trailing candidate. Before these assembly elections, he was MP from Amritsar lok sabha seat and resigned as lok sabha member from he became an MLA in the Punjab Vidhan Sabha. Personal Profile : He was born at Patiala on 11-3-1942. He belongs to the royal family of Patiala and is son of Maharaja Yadavendra Singh, the last king of erstwhile princely state of Patiala. Irrigation Department - Rana Gurjit Singh is the irrigation minister of Punjab. 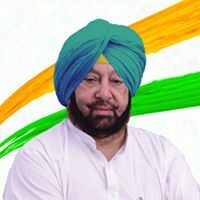 He is a senior leader of Congress party and is MLA from Kapurthala vidhan sabha seat. He has a vast business empire and is one of the richest MLAs in Punjab. Rural Development and Panchayats - Tript Rajinder Singh Bajwa, is the cabinet minister of this department. He is MLA from Fatehgarh Churian constituency in Gurdaspur district. Dairy Development - This department is headed by chief minister himself. Animal Husbandry and Fisheries - This department is also headed by chief minister himself. Revenue Department - Revenue Department is one of the most important department for the people involved in agriculture. This department maintains the land records of ownership of agriculture as well as non-agriculture land and also gathers the statistics about the crops sown on the agriculture land. This department is also headed by Capt. Amrinder Singh. In India, agriculture related matters are managed by Department of Agriculture, Co-operation and Farmers Welfare and it comes under the Ministry of Agriculture and Farmers Welfare. Radha Mohan Singh is the agriculture minister of India. He is an MP from Purvi Champaran constituency in Bihar state and belongs to BJP.